From Gucci's Dive collection, this Swiss Made timepiece exudes style and functionality, with a 45mm yellow gold plated case and tachymetre bezel. 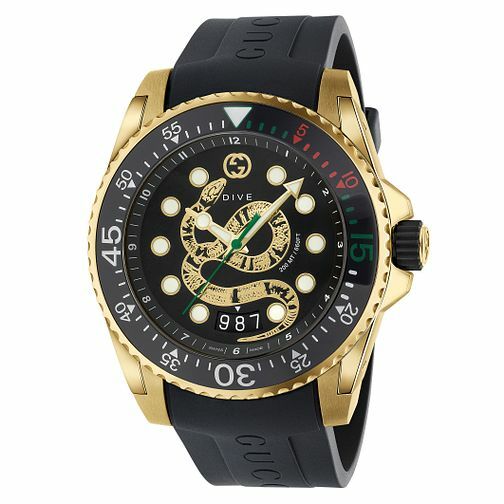 The bold black dial presents a rose gold tone snake motif, date display at the 6-o-clock position and round hour markers with the 12-o-clock position taken by the signature Gucci G logo. With ETA quartz movement, this timepiece's finishing touch is a black rubber strap, with adjustable wrist size.